The Schmutzbuster Avodah Weekend has been cancelled! We hope to host another Alumni Weekend in the Summer of 2018! Alumni and guests who are 21 years old and older are welcome at Camp! 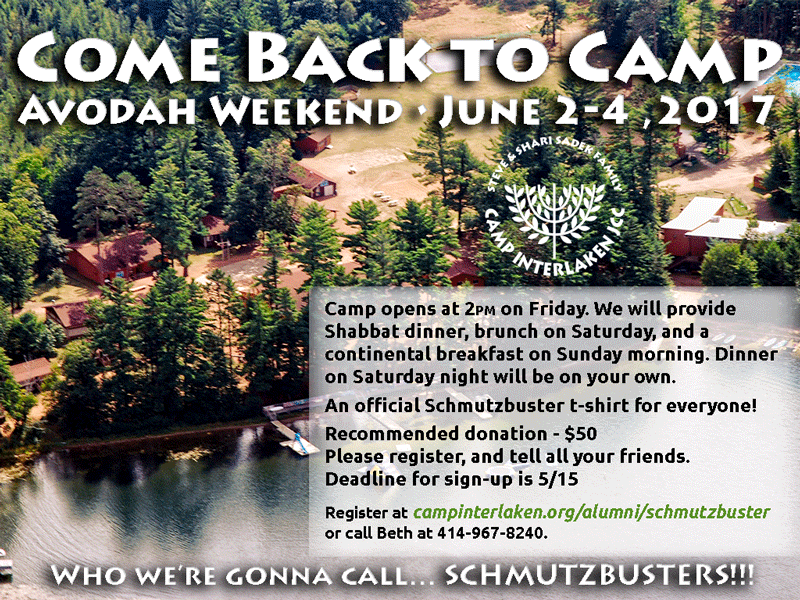 Join us at Camp Interlaken to help with some Avodah to get Camp ready for the summer season! Reconnect with Camp, with old friends, and enjoy a weekend on Lake Finley! 10:30 am Morning services & brunch followed by Kiddush luncheon. Saturday dinner will be on your own. Minimum donation of $50 per person recommended to help cover the cost of housing and meals.